PHILADELPHIA – June 22, 2016 – The Middle East Forum announces a victory in federal court over the Muslim Brotherhood-linked Council on American-Islamic Relations (CAIR). 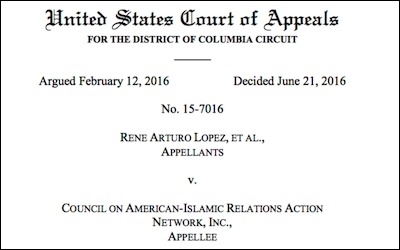 The Forum-funded fraud lawsuit against CAIR's national office that had been summarily dismissed by a federal district judge in 2010 was unanimously reversed yesterday by the United States Court of Appeals for the District of Columbia, sending the case back for a full trial. Soon, a court of law will weigh evidence that CAIR defrauded hundreds of prospective clients in search of legal counsel. Morris Days, a representative of CAIR's now defunct Maryland/Virginia chapter, took money from numerous CAIR clients in exchange for the promise of legal services. But Days was not an attorney, and was non-responsive to clients. He later admitted taking the money for personal enrichment. The Appeals Court determined enough evidence exists to hold CAIR National liable, as Days was its agent. The FBI severed non-investigative relations with CAIR in 2008. In 2014, the United Arab Emirates (UAE) government declared CAIR a terrorist organization. The Middle East Forum promotes American interests through intellectual, activist, and philanthropic efforts. Related Topics: Council on American-Islamic Relations, Muslims in the United States receive the latest by email: subscribe to the free mef mailing list This text may be reposted or forwarded so long as it is presented as an integral whole with complete and accurate information provided about its author, date, place of publication, and original URL.